It was great to interesting to see how Subodh Gupta integrates humor into his art work. In his sculptures, Gupta pokes fun at the western art world’s description of his work in relation to Jeff Koons and Damien Hirst as if there is no way to understand eastern artists without a reference towards western art. Click here to read Kavita Ramdya’s “Worshipping the Common Man“, an art review of Subodh Gupta’s show “The Common Man” at Hauser & Wirth. Subodh Gupta, known as the “Damien Hirst of Delhi” and “India’s Jeff Koons”, worships the “common man” as opposed to, respectively, hyper-commoditized morbidity and the mass consumption of name-brand art. Hauser & Wirth’s Old Bond Street and Piccadilly galleries are currently showing Gupta’s work in a show entitled “Common Man” which pays homage to India’s labourers rather than the Hindu gods and goddesses typically displayed in museums and galleries exhibiting art from the Indian subcontinent. “Common Man” integrates everyday objects, from mangoes and chappals (slippers) to tiffins (steel lunch boxes) and thalis (pans used during worship), to create thought-provoking yet aesthetically-profound sculptures. His attention to detail combined with his commentary on India’s labor population confirm why Gupta is currently India’s most celebrated living artist. There are a number of untitled works, including a seven-foot wide stainless steel thali pan filled with kitchen utensils, tiffins, and pails, a work meant to pay respect to the way labourers eat: employing re-usable eating utensils and tiffins brought from home to the work site. In another untitled yet striking piece, Gupta’s team took a mould of a tree growing out of a window from the artist’s hometown of Bihar as a way of highlighting how nature forms around and in spite of man-made objects. What differentiates Gupta from his contemporaries is not only his worship of the common man but also the humor in his work. In another untitled work, the viewer recalls Damien Hirst: a large fibreglass skull is ringed with stainless steel eating utensils. Here, the artist makes fun of the western media’s description of him as “the Damien Hirst of Delhi”, as if contemporary Indian art can only be understood in reference to western artists. Likewise, in an attempt to recognize the western media’s description of Gupta as “the Jeff Koons of India”, the artist took two years to create fifty aluminium boxes bearing the Jeff Koons “Puppy” branding in a work titled “Jeff the Koons”. In a marketing ploy, Koons had created an “unlimited” rather than “limited” edition of his art work as a way to turn the economic model of supply and demand on its head which Gupta subsequently pokes fun at for Koons’s obvious effort to position his art for widespread, mass consumption. Perhaps the most poignant and devastatingly hard-hitting piece is “I Believe You”, another large thali pan, this time covered with battered shoes worn by day labourers. While visiting an Indian village, Gupta traded the labourers’ old shoes for new ones. The shoes are served on a thali pan normally used to carry coconuts and candles as well as other assorted fruit, rice and spices as offerings when worshipping Hindu gods and goddesses. In a clockwise motion, worshippers will move the thali pan in front of a Hindu idol or photograph as a way of doing arthi, or making an offering. 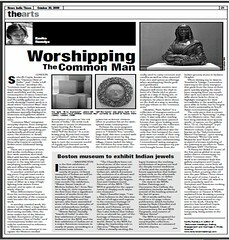 In Gupta’s sculpture, he places worn shoes on the thali pan as a way to worship and pay tribute to “the common man”. Likewise, “Aam Aadmi” (Hindi for “man people”) is a collection of mangoes surrounded by hay sitting in a wooden crate. It was only after reading that the mangoes were painted bronze that, upon looking more closely, I could see the reflection of the overhead lights in the mangoes; the reflection was the only clue that betrayed the mangoes were not made of their original organic materials, a true testament to Gupta’s craftmanship. I remembered eating mangoes every summer, mangoes my parents brought home from the Indian grocery stores in Jackson Heights. When visiting my in-laws in Trinidad & Tobago, I remember rejoicing in the juicy mangoes which grew from the trees in their yard, quickly wiping the sweet juice escaping from my mouth after each succulent bite. Gupta talks about how he chose to highlight mangoes for their accessibility to the wealthy and poor alike in India, but he forgets the fruit’s universality in South-Asian communities globally. 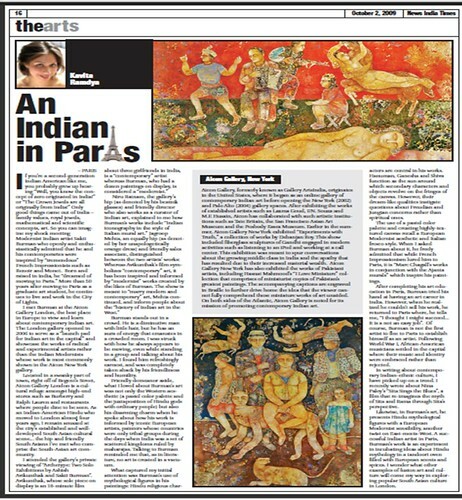 “A Penny for Belief II” is one of the few pieces global in scope rather than a commentary on India’s “common man”. The work is an oversized thali pan which gallery employees and Gupta threw coins into, coins from all over the world including British sterling, American quarters and Euros, before pouring olive oil into the pan. When I bent closer to the pool of coins, I smelt a strong odor of olive oil which is more popularly used in European and American cooking rather than Indian. Maria de Lamerens, the Press coordinator at Hauser & Wirth, explained how throwing a penny for good luck is a universal practice which Gupta wanted to capture in the work. Clearly the practice has benefited Gupta whose name and work are counted among the best contemporary, living artists in the world. Click here to read Kavita Ramdya’s review of Nina Paley’s animated film “Sita Sings the Blues”. A few days ago I interviewed cartoonist Nina Paley for a review I wrote of her animated film “Sita Sings the Blues”. The movie is fantastic – it’s funny and smart. “Sita Sings the Blues” is a modern take on the ancient Hindu text “The Ramayana”; the movie picks up when Rama is banished to the forest for fourteen years with Sita accompanying him. However, the story is told from Sita’s point of view; she emerges as an intelligent yet gullible ingénue head-over-heals in love with an effeminate Rama who is overly concerned with what other people think of him. He’s clearly not good enough for her. I was surprised by how much interest my review in “News India Times” generated; readers e-mailed to tell me that they were eager to watch the movie which is available for free on YouTube. 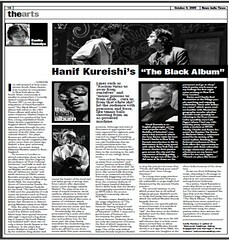 Even readers of my parents’ generation, a generation that didn’t grow up with home computers and are considerably less computer literate for it, were inspired to take advantage of the free, on-line creative content. Apart from the colourful animation, diverse soundtrack and the East-meets-West look and feel, what does the success of Nina Paley’s film indicate? I propose that there is clearly a market for modern, updated versions of classical and religious stories, myths and beliefs we’ve all grown up whatever our faith. People have an innate desire to listen to stories which explain their origin and their past. In a world where media has exploded to include graphic novels, the internet, HD-screen TVs and mobile phones, we’re seeking stories from non-traditional outlets that also recognize that the world is a much more complicated place now than it was when many of these myths, stories and beliefs were formulated. Paley’s 72-minute movie tells the story of Sita and Rama from Valmiki’s Ramayana in a way that can only be described as accessible, fun and modern. Her project – to provide an animated reinterpretation of Hindu mythology from a modern and a female point of view – is a risky one but has proved fortuitous for her career: the film has received global media recognition and an enthusiastic response on You Tube, where you can watch the film for free. Like many great works of art, albeit typically poetry and fiction, Paley’s inspiration for creating the film stemmed from challenges in her love life. After she moved to Trivandrum, India, for her hus-band’s career, he dumped her, leaving her alone to navigate India. However, the hardship she endured as a single, heartbroken woman in India gave her the insight to understand the nature of Sita’s devotion for Rama. Rather than serve as a “sexist parable,” she writes in her blog, the Ramayana describes “the essence of painful relationships” and provides a “blueprint of human suffering.” Paley likens her husband and his cowardly abandonment to Rama and her own blind love as analogous to Sita’s. The film, although an animated feature, is by no means a children’s movie. Instead, Paley has interwoven four disparate plots into her film. The viewer is first introduced to Paley’s autobiographical rendering of her failed marriage. The second is the comical back-and-forth between three shadow puppets who debate the mythology’s details and characters’ motivations in the Ramayana. Third, the viewer benefits from a retelling of Sita and Rama’s love story. In this story line, Sita is portrayed as a sickening goody-two-shoes, Rama as a spoiled and effeminate prince and Ravana as the prototypical Bollywood villain. Finally, Sita sings the blues. Paley appropriates the music of Annette Hanshaw, a jazz singer from the 1920s and ‘30s, for Sita to croon in episodic bursts of song throughout the film. In order to distinctly divide the four story lines, Paley not only provides a different sound track for each story but also a different “look and feel” in order to visually distinguish the plots from one another. The autobiographical scenes of her disintegrating marriage take place with the background of lonely yet cramped cities. The three hand puppets discuss the facts of the Ramayana while textbook-like images pop up to accompany the debating. The story of Sita’s love for Rama is told from her feminine point of view; the scenes are drawn in the style of traditional Mughal art. Finally, Sita’s musical numbers where she fawns over Rama and sings the blues have a comical and cinematically dramatic feel appropriate for the sound of early 20th-century blues music and film. “Sita Sings the Blues” is by no means the first attempt at dramatizing the ancient love story of Rama and Sita in a modern way. Like many of my peers, I grew up listening to my mother reading Amar Chitra Katha comic books that depict the religious Hindu myths for Indian-American children to learn the ancient stories. It was through these comic books that we learned who the various gods and goddesses were, their relationships with one another and their religious significance. And who can forget the horn that blows in the beginning of every one of Ramanand Sagar’s television episodes based on the Ramayana? The series, although revolutionary in the way it depicted a significant Hindu text and made it accessible via free mass media so that Indians from all classes, occupations and regions across the subcontinent could enjoy the shared religious story, was somewhat painful to watch as a young child. Even to a young child, Sagar’s special effects were clumsy and the acting overly dramatic compared to Nickelodeon and MTV programming. In 2003, my husband and I were lucky to see a dance performance of the Ramayana performed by the Lotus Fine Arts Productions. The choreography was stunningly sensual, the costumes vibrant and the tabla sound hip. Significantly, the production was among my first experiences watching dance accompanied with a story line. Alas, Lotus Fine Arts Production no longer exists, but today’s youth can benefit from Paley’s animated depiction of the Ramayana for the same effect: conveying ancient Hindu mythology with innovative technology and a modern sensibility. You, too, will find “Sita Sings the Blues” worth crooning about.